Holton T102 and GT102S the same trumpet model? Posted: Thu Mar 14, 2019 1:33 pm Post subject: Holton T102 and GT102S the same trumpet model? I've been reading great things about Holton T102 being a very good instrument, inspired by a Bach 43 trumpet. Not far from where I live, there is a Holton GT102S for sale for a decent price. I wonder if this is the same model as the Holton T102 that people talk about. 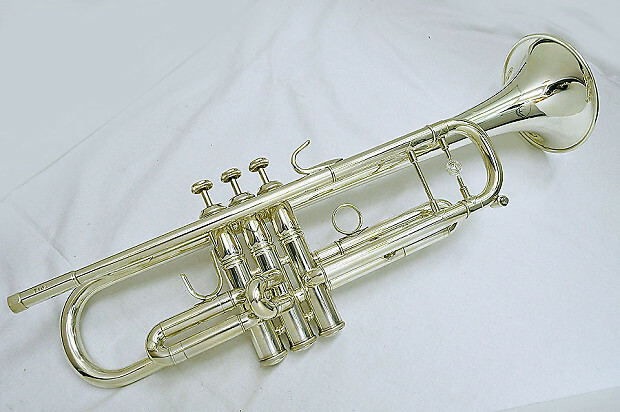 Are Holton T102 and GT102S the same trumpet, modelled after the Bach 43? If they are not the same, what can you tell me about the GT102S? First, it is important to note that there was more than one “T-102”. The first in 1965 was based on the Model 50 “Medium bore” that had been released in 1962 and was extended (with some minor changes and going from 2 models to 4) following the 1965 sale to Leblanc as T-101, T-102, T-103 & T-104. These were Conn 38B inspired horns unrelated to the later T-10X series based on a 1981 Elkhart Bach purchased locally, dis-assembled, and measured at the old Martin plant. The 1981 T-10X series consisted of the T-101 that was the clone of the Bach purchased (with different threads and a slight difference in the piston mass & length) which was a 37. Then the T-102 was the same with a 43 bell and the T-103 got the 72 bell clone. The 38B .459 bore continued for a time as the T-104. Also, an LT-101 lightweight version was released a bit later. In 2000, the LT-101 was on its way out and 100 LT-101 bodies were combined with standard weight 37 bells to make the TM-2000s, which were so well received that the design was continued in 2001 as the T-105. The ”GT” designation is unusual, and I only see these coming from overseas. Specifically, I have only seen it on horns being sold by a specific company in Japan, and applied to both the 1981 T-10X horns and the post-2000 versions that have only one main brace. These only appear as serial 87XXXX instruments (right around the point at which the bracing changed) and only as T-102 and T-103 (no 37s). I have seen also both receivers marked T-10X and marked just Holton on these, which is odd given the very close serial numbers between those in both the case of the bracing and the receiver. The stop screw on the third valve slide is inconsistent with T-10X horns of any vintage I have seen from US sources. The Bach stop rod remained in use on T-10X horns until the end of Holton in 2007. There do not appear to be scars from prior stop rod posts or a brace in the original position now occupied by that screw. I can only offer guesses as to reasons. I have not been able to get a good look at the markings on the back of second valve on any of these. If the “G” and the “S” appear to be added symmetrically at either end of “T102” there over “USA”, then I would lean toward these being a product of the seller. If not though, then they must have been a brief experiment. Your statement is consistent with the results I get form searching "GT102S" on Google. Most results are in Japanese and maybe Chinese. The “G” is perfectly aligned and the “S” is not marked. C'mon OldSchool... Is that all you've got??? We need some REAL info here!! While I'm not familiar with the T-102, I've owned two T-101's (still have one). consistant with a balanced and vibrant sound. The Holton-Bach tooling relationship actually went the other way. When Holton was shut down, the only surviving twin to the bell hydroforming machine used by Bach today was at Holton and was transferred to the Bach plant. The T-101 was made from the measurements of an Elkhart Bach (It's a 180, most of the Mt. Vernons 1954-Nov. 1962 were not 180s, though there were 180s built at Mt. Vernon Nov. 1962-Dec. 1964). The T-101 tooling was Holtons - and that leads to a problem when people try to forcibly replace Holton caps with Bach ones - the threads do not match! Also, the difference in the piston means that Bach valve guides do not work on the 1980s T-10x series. The T101 was a copy of a Bach Strad 37 bell 25 lead pipe 459/460 bore.The T102 was aT101 459/460 bore with a different lead pipe ,slightly rounder and larger tuning slide crook and a slightly longer 3rd slide. It had the same 37 bell as the T101. The measurements for the T102 mouth pipe were provided by Global, our Japanese distributor.They worked with us to develop GT102 and GT103. The "G" in front of the "T" stood for Global distributors only.Non Global versions had a "T" only. The GT/T 103 used the T102 lead pipe but in the reversed style and the bell was an MF bell. A great full sounding horn. ... The measurements for the T102 mouth pipe were provided by Global, our Japanese distributor.They worked with us to develop GT102 and GT103. The "G" in front of the "T" stood for Global distributors only.Non Global versions had a "T" only. The GT/T 103 used the T102 lead pipe but in the reversed style and the bell was an MF bell. A great full sounding horn. To me, it's still very unclear about what the 'development' of the GT102 and GT103 entailed, and the differences between the 'G' and 'non-G' versions. Maybe just cosmetic changes for a particular market area? The ”GT” designation is unusual, and I only see these coming from overseas. Specifically, I have only seen it on horns being sold by a specific company in Japan, and applied to both the 1981 T-10X horns and the post-2000 versions that have only one main brace. These only appear as serial 87XXXX instruments (right around the point at which the bracing changed) and only as T-102 and T-103 (no 37s). Can you guess the year? It has two braces with the Holton symbol on the first brace. I'll go to the store next friday to check it out. I'll let you know how it plays. I have only had 37 belled versions, so now I am curious to see a 102 or 103 in person and get some measurements. While the bulk of internet chatter has always supported the 43/72 bell story, the source for this quote is impeccably credentialed on this topic. I notice that the GT-103s that have appeared on the market are not reversed however, and if that is an MF bell, it would have to be one of the ML bore ones (bell tail does not look like the .468 MF bell). From what I can see, I suspect that the G prefix does indeed correlate to cosmetics from & for the overseas market at the time. The valves of the GT102 trumpet were not in a very good shape and I didn't like the way it played. Not what I was expecting. I ended up buying a very good intermediate level Yamaha trumpet from the 80's. I'll start a topic about it later, because it's a very interesting instrument.